Rectangular shaped with a decorative panel top, this castered cocktail table is a unique piece to outfit your living area. 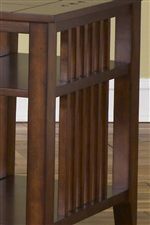 Featuring a Mission style design, it has softly tapered legs and square spindle sides for accent detail. 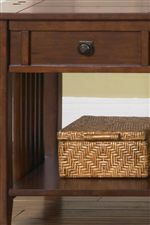 Two center drawers are decorated with antique brass knobs with back plates and provide the perfect place for tucking away small items, such as your remote control and TV guide. A lower inlay shelf offers additional space for setting magazines and books. Just the right balance between casual and formal, outfit your home and complete your living space with this charming cocktail table. The Prairie Hills Rectangular Cocktail Table with 2 Drawers & Inlay Shelf by Liberty Furniture at Northeast Factory Direct in the Cleveland, Eastlake, Westlake, Mentor, Medina, Macedonia, Ohio area. Product availability may vary. Contact us for the most current availability on this product. Wood & Finish Sophisticated and high-end quality finishes available with a reputation for strong competitive advantages, distinctive appeal, and a high level of perceived value. Finish & Paint Options Satin Cherry finish. Storage Two center drawers with lower inlay shelf. Case Construction Constructed from select hardwood solids & Cherry veneers. Take a walk and find yourself wandering home to the Prairie Hills occasional collection. Crafted from hardwood solids and Cherry veneers, it has a warm Satin Cherry finish that is comforting in all the right ways. 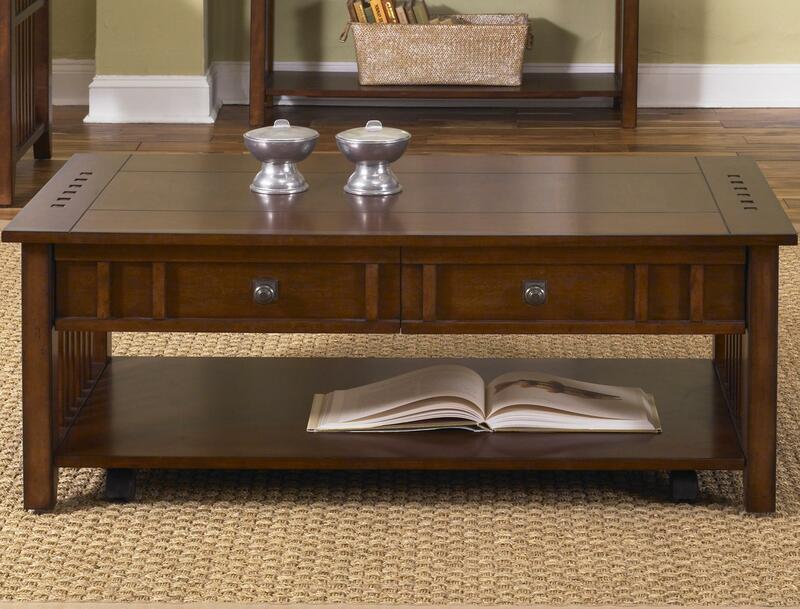 Featuring a variety of pieces to outfit your living space, Prairie Hills includes a collection of Mission style occasional tables to lighten up your home. Softly tapered legs, straight line styling, and square spindle sides all work to add beautiful decorative detail to please, and inlay shelving offers ample storage space for home accents. Refreshingly simple with just the right touch of details, Prairie Hills provides the perfect pieces to outfit your home. The Prairie Hills collection is a great option if you are looking for Mission furniture in the Cleveland, Eastlake, Westlake, Mentor, Medina, Macedonia, Ohio area. Browse other items in the Prairie Hills collection from Northeast Factory Direct in the Cleveland, Eastlake, Westlake, Mentor, Medina, Macedonia, Ohio area.